Cast: Akshay Kumar, Ileana D’Cruz, Arjan Bajwa, Esha Gupta. Synopsis: Akshay Kumar plays as Rustom Pavri, a decorated and true patriotic naval officer of Indian Navy and a loving husband. After returning from his sea trip, he soon finds out about his wife Cynthia’s (Ileana D’Cruz) infidelity with his friend Vikram Makhija (Arjan Bajwa). He kills his wife’s lover with 3 three dead shots from his service revolver, and then the story matures with quite offbeat and non-dull court hearings and some internally connected unknown facts with the murder plot. Review: Akshay Kumar starrer, Rustom, the most recent release is a perfect mix presentation of 1959 case of Commander K M Nanavati, which buzzed the nation and changed so much in Indian Judicial System. The film will surely give you the reality gist of the case along with non-monotonous court hearing sessions and some finely embedded humour in it. As per the case of 1959, a naval commander K M Nanavati, a Parsi, was interrogated in court for murdering his wife’s lover, Prem Ahuja. He had killed him with his service revolver, firing 3 bullets. After long court sessions, he was declared innocent with the 8-1 verdict and was freed assuming that it was a case of culpable homicide not amounting to murder. That means, it happened, because of the heat of the moment, and was not pre-plotted. Here, Tinu Suresh Desai’s directorial skills come into the real picture, by framing and giving us a basic idea about an infamous incident. Undoubtedly, the intact portrayal of the storyline keeps the essence alive, and the reveal of the end twist makes you realize, why the movie makes so much sense. The courtroom drama and interrogation sessions of police are intendedly made on a humourous side. In the movie, Rustom Pavri (Akshay Kumar), is happily married to his wife Cynthia (Ileana D’Cruz), but when he comes back from his long sea journey to meet her, he comes to know about her love affair with his friend Vikram Makhiija (Arjan Bajwa). After an affirmation from his wife, Rustom withdraws his service revolver from Navy armoury, rushes to Vikram’s house. He shoots him dead with three continuous shots and exposes himself fearlessly as the offender. He surrenders himself to police. After then, Vikram’s sister Preeti Makhija (Esha Gupta) wants Rustom hanged till death and the investigation begins. 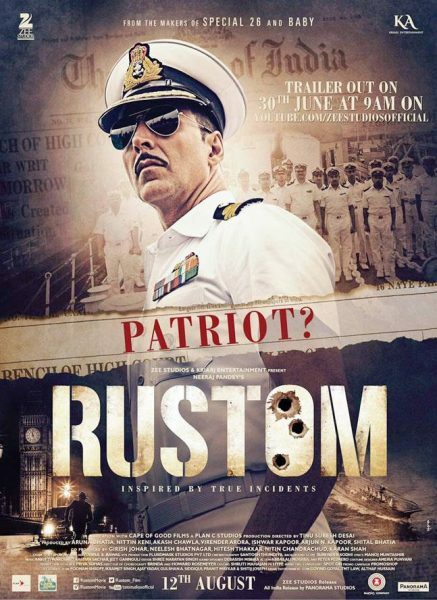 The story takes an engaging turn when Rustom denies that he is a criminal and pleads not guilty in the court. The first half of the story religiously revolves around the real incident and Akshay takes more toll of his character, Rustom. Before the interval, the story moves quite flat with little melodrama involved. Desai has tried a quiet to paint the movie appearance in the 50-60s era but hardly meets the standards. However, you can get that gist from Illeana’s classic makeup and attires. Also, the use of vintage cars, old unu elektroroller scooters, naval ships, 60s house of Rustom does a fair dealing with movie’s authenticity. The major charmer of the movie which can keep you glued to your seats is the court hearings and Akshay’s sterling justice with his character. It’s hard to separate Rustom and Akshay Kumar while he is donning that white navy uniform. Ileana looks appealingly pretty throughout the film and blends perfectly with the character. Arjan Bajwa has happily accommodated the character in him and fits perfectly. Esha Gupta looks stunningly alluring but gets a narrow ground to showcase her skills. Some other supporting actors like Pawan Malhotra, the investigating officer implants convincingly in the plot. Rustom’s household servant, Usha Nadkarni’s will surely give you some fair giggles like she always does. Mukund Mishra appears to be quite supportive in inviting the fun factor in the movie. The portrayal and story is surely worth a one time shot, though not so much decorated with music and sweet rhythms but has an equitable balance of highs and downs. You hardly will be able to spot any directional flaws in the movie and the casting feels quite accurate. Once again, Akshay Kumar has appeared a legitimate and content gentleman like he always does.